The most widely used vegetable in salads – Cucumber is a wonderful vegetable to cool you off in scorching heat in the summers. This cheap, humble and easily available vegetable is packed with nutrients which are beneficial for our body and skin. This vegetable is free of saturated fats or cholesterol and its peel is a good source of dietary fibre that helps reduce constipation. They contain anti-oxidants such as carotenes, vitamin-C, vitamin-A, Zea-xanthin and Lutein which offer help against free radicals and reactive oxygen species (ROS) that play a role in aging and various disease processes. It is also high in Vitamin K content which plays a valuable role in maintaining bone strength. It is loaded with potassium which is an important intracellular electrolyte. It helps reduction in total blood pressure and also potassium is essential for a healthy heart. 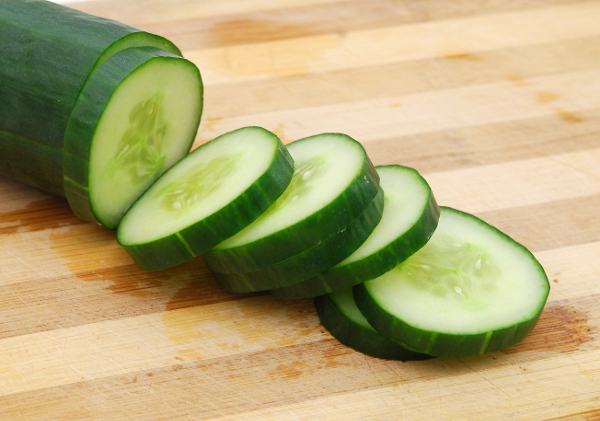 Cucumbers have a mild diuretic property, which helps in checking weight gain and high blood pressure. Cucumber is also a favorite extract when it comes to formulating cosmetic products. It is herbal and non- irritating and widely used as remedy for puffy eyes. They make excellent ingredients in creams, gels and face packs. Below are some of the face pack recipes using Cucumber. Mix a pinch of turmeric, half cucumber pulp and a teaspoon lemon juice. Apply on face for 15 minutes and wash off with warm water. You can also add egg white to this paste. Mix yoghurt and cucumber pulp to make a paste. Apply on face for 15 minutes. Wash off with warm water. Mix two tablespoons of cucumber juice with rose water and fuller’s earth. Apply on face for 15 minutes and wash off with warm water. Mix a tablespoon of oats with cucumber pulp. To this mixture add honey/ Malai. Apply on face for 15 minutes and wash with warm water. Chop half cucumber and apple. Mix in a tablespoon of oats and blend into smooth paste. Apply for 20 minutes and wash off with warm water. Mix one tablespoon of each cucumber juice and mint juice. Apply this all over the face for 15 minutes and wash off with water. One aloe plant leaf gel/ one cup aloe juice and mix grated cucumber. Apply the paste all over the face for 15 minutes. Wash off with warm water. Make a paste of half cucumber, avocado and tomato. Mix a tablespoon of honey. Apply on face for 20 minutes. This face pack will soften your skin and reduce blemishes. Grate half cucumber and bottle gourd. Add a tablespoon of yoghurt and gram’s flour. Apply on face for 15 minutes. Wash off with warm water. This face pack is perfect for all skin types. Grind a tablespoon of oats and mix them with grated cucumber. Add 2 tablespoons of buttermilk and lemon juice to the paste. Blend. Apply on face for 15 minutes. Wash off with warm water. Two Tablespoons of yoghurt, half tablespoon of honey and lemon juice; to this mixture add grated cucumber and 3 capsules Vitamin E. Apply on face for 15 minutes and wash off with warm water. Sounds so refreshing! Go try a few of these face packs and let us know the results. Hope you will surely going to reap these cucumber face pack benefits by making the face packs all by yourselves.